What Does A Project Management Office (PMO) Do? 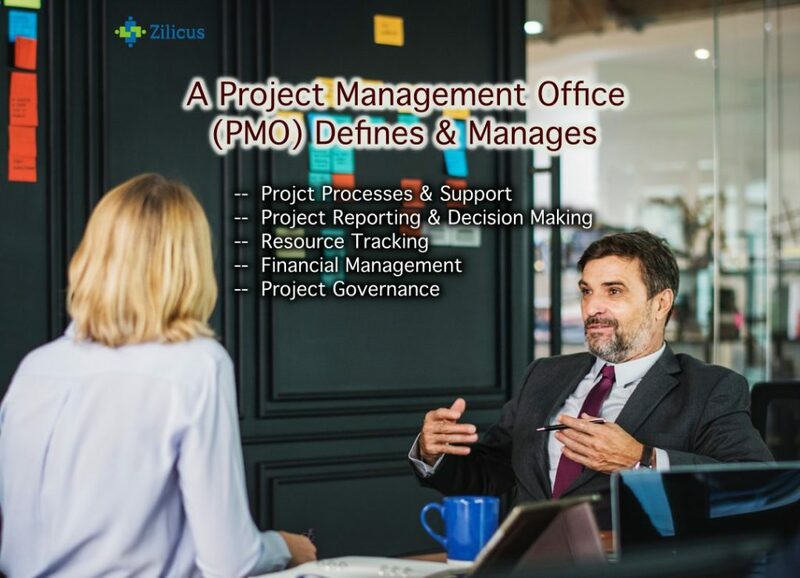 In the previous post we were introduced to of project management office (PMO) and broadly looked at what it strives to achieve, what are its goals and types of PMO. In this post we will get into the details of, what does a project management office (PMO) do? A PMO in enterprise business is in fact, structured and perceived as a department that oversees or get involved in project management activities across the departments of the business. These activities typically include project management training, coaching, governance, implementation, identifying need of project management for a given business problem, or determining the best practices to manage project planning, tracking, to create project template, project reports. On the other hand, in case of small or medium enterprises, though PMO can take a formal shape but is represented by an individual or a small set of people. But even in smaller scale, PMO in SME can identify and address the same issues as in large enterprises and support business functions in managing projects better. Advocate, champion for greater adoption of project management processes (which by the way, isn’t just about schedule/Gantt chart or project cost tracking; project management processes as a whole – right from project approvals, project budgeting, schedule planning, risk management, resourcing, incident management, time & expenses tracking, change management, meeting management, etc). Decide the rules of the games by creating common standard of policies, procedures for conducting project management in the organisation; also decide, implement & track project management KPIs. A project management office (PMO) serves as a linchpin to make project management approach successful for a given organization. Many people consider it as support function. Fair enough! It does provide support for making project related decisions. So what kind of support does PMO provide? 4 Project Governance Having checks and balances without making in it too bureaucratic to manage projects. The governance function involves auditing projects, conducting reviews. It also means defining clear roles and responsibilities and structure to ensure transparency and accountability. The whole objective behind project governance is to make sure that the project related decisions are made by right resource by applying best of their minds with right information. In next post we will delve further into project management office functions and activities it has to perform on a day to day basis. Your life can be become easier with the right project management system. ZilicusPM is the right PMO software tool for you and your team. Get started now. What Does Project Management Office (PMO) Really Do?